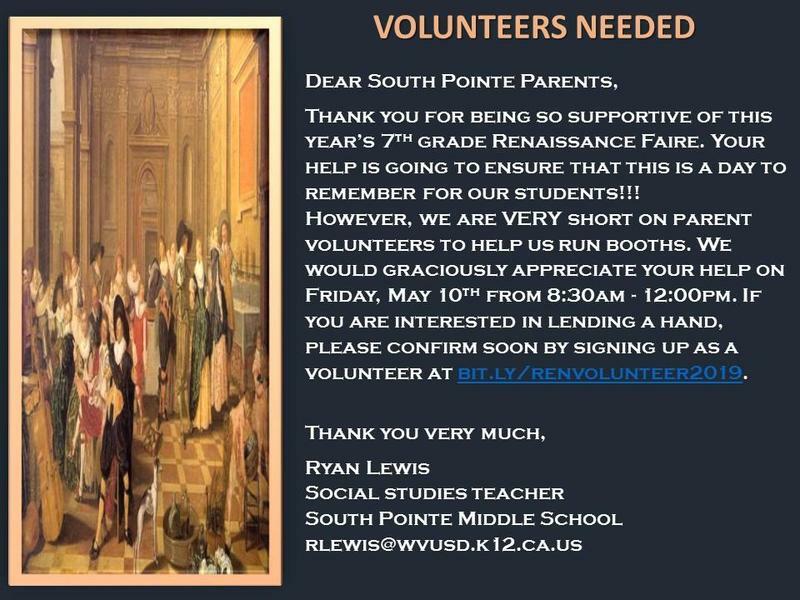 We are in need of parent volunteers to help us run booths. 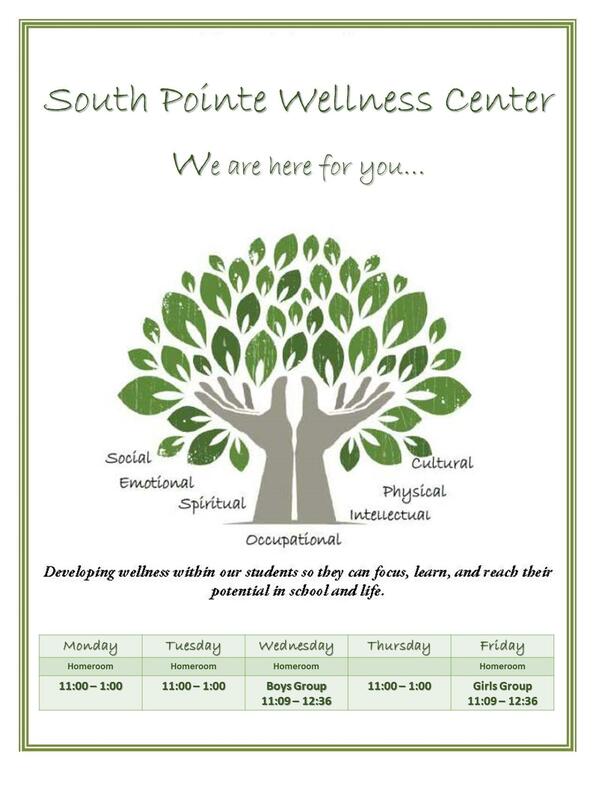 We would graciously appreciate your help on Friday, May 10th from 8:30am - 12:00pm. Your help is going to ensure that this is a day to remember for our students!!! If you are interested in lending a hand, please confirm soon by signing up as a volunteer at bit.ly/renvolunteer2019. Our 6th Gr. Campers have arrived! Congratulations to Robert Herrera ~ Cornerstone Award. Robert Herrera, Cornerstone Recipient & SPMS therapy dog, Laker. Our STAR Student of the Year! 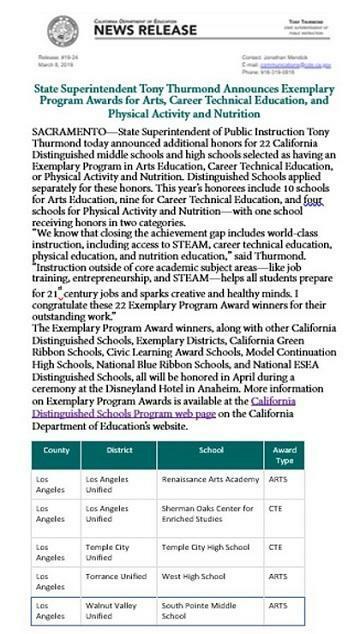 Congratulations to our 2018 Teacher of the Year, Kathryn Fujihara ~ Congratulations to our very own Cornerstone Award recipient Mary Weir ~ South Pointe is named a: National School-to-Watch~2016 NAMM Support Music Merit Award School ~ A California Gold Ribbon School ~ California Exemplary Arts School~ California Distinguished School~ California Business for Education Excellence School ~Panther Pride...It's EVERYWHERE! Eight Grade Victory Celebration ...and how to get there. 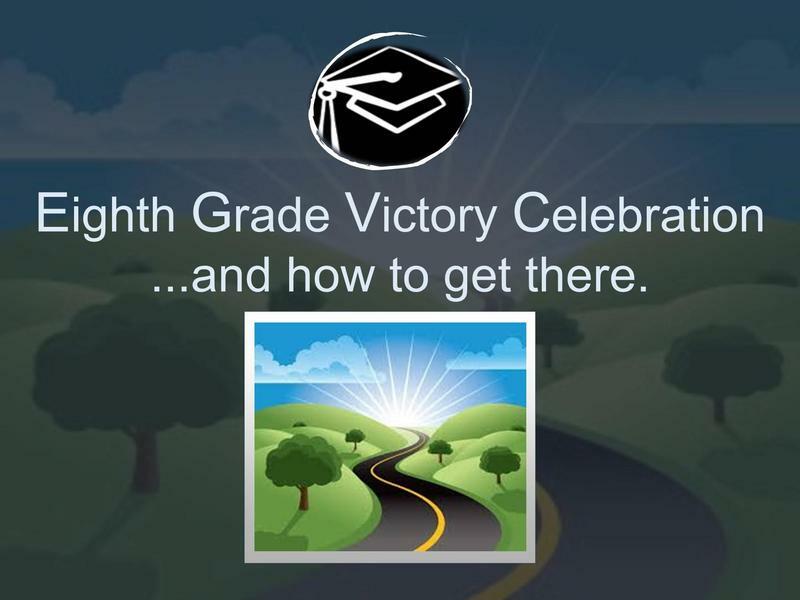 Parents and students, this Victory Celebration presentation will provide you important dates, eight grade activities and requirements leading up to Promotion day. Learn about the eight grade dance, picnic, panoramic picture, award ceremony and much more. Panther pride ...it's everywhere! 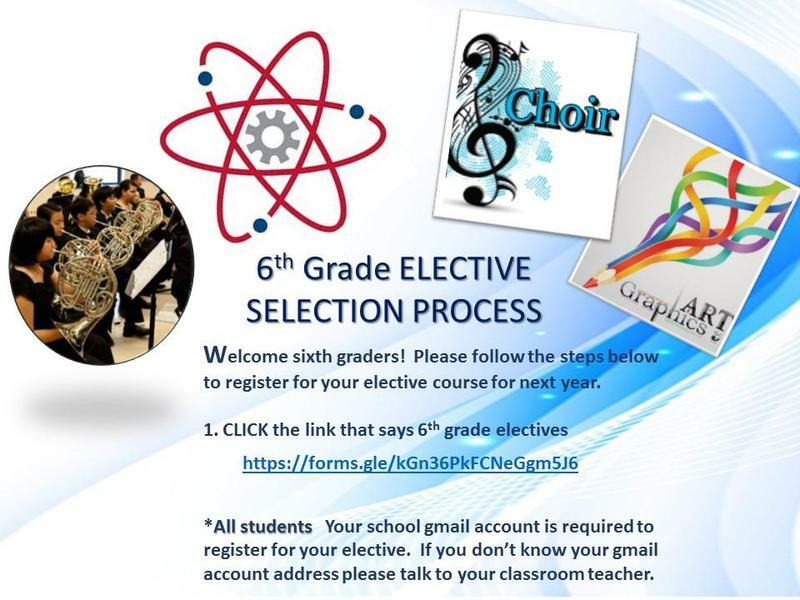 6th grade students choose your electives now! Click on the header above and link. Sign up for your electives now! Go to your student portal and follow the steps to register for your elective course for next year. 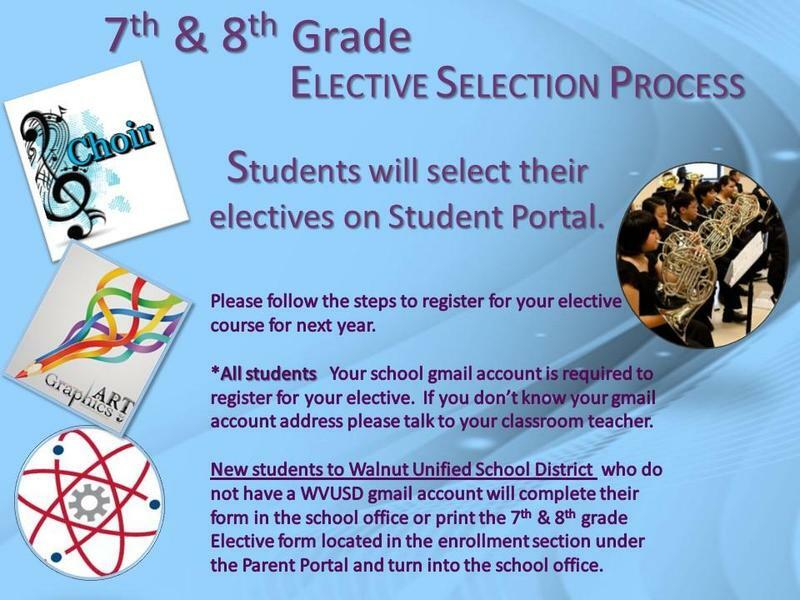 New students to Walnut Unified School District who do not have a WVUSD gmail account will complete their form in the school office or print the 7th & 8th grade Elective form located in the Enrollment section under the Parent Portal and turn into the school office.